Poster by San Francisco Poster Brigade, Rachael Romero San Francisco, California, United States, 1978. The African Activist Archive documents activism in the United States that was part of the international anti-apartheid and anti-colonial movement supporting the struggle for justice in South Africa and all of southern Africa. The movement it documents includes the fight against white colonial rule not only in South Africa but also in the former Portuguese colonies of Angola and Mozambique as well as Zimbabwe and Namibia. 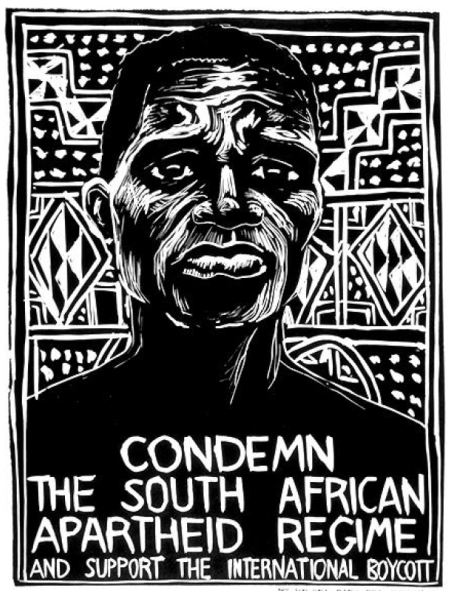 Activists in this solidarity movement produced flyers, T-shirts, buttons, and other political ephemera and educational and organizing materials that articulated their stance against apartheid. The African Activist Archive consists of more than 10,775 of these artifacts from the 1950s to the 1990s, and the digital collection is still growing. In collaboration with the MSU African Studies Center, MATRIX has worked to assemble and make available a large digital collection, presented with accompanying metadata that allows the site to tell the story of the African activist movement in the United States. We encourage you to browse and use these materials to enhance further understanding and teaching of American activism against international racism, including corporate divestment campaigns on campuses and in communities; lobbying on city, state, and U.S. government policy; and support for liberation and democratic movements in southern Africa.